A view of the artist’s hometown in northern Tochigi. This is a view of the former Kurobane-machi (now Otawara-shi, Tochigi), where Ishikawa Kangan grew up. 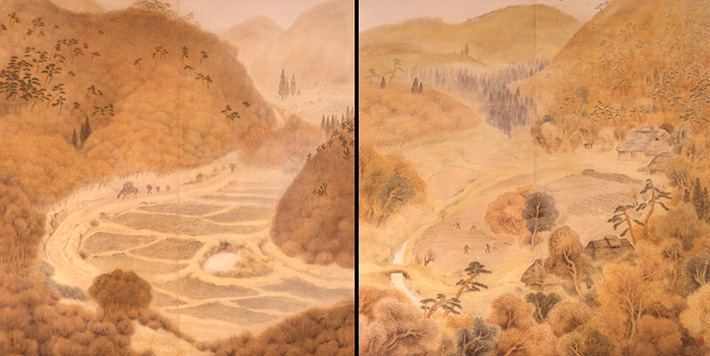 The path meandering along the foot of the mountain, the bridge across the stream, the crooked footpath between the rice fields, and the appearance of the thatch-roofed farmhouses—this landscape remained just as it is portrayed here until around 1980. The landscape was alive within life in the farming village. Views of an earthly paradise inspired by actual landscapes, an artistic style distinctive of Kangan, began here. The landscape which put on beautiful changes as the seasons went by can no longer be seen today due to reorganization of arable land.